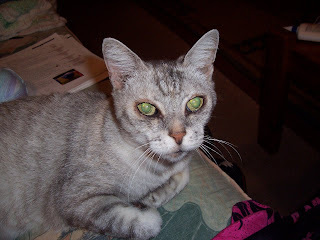 This is Queenie - our Burmilla - she is a very old lady now - 14 years old. 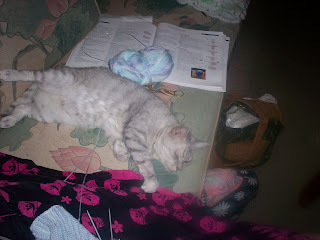 She likes to sit next to me when I am knitting - but she doesn't like any of my junk up there with her - so she pushes it all on the floor! 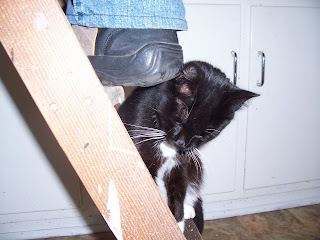 See how she is flexing her front paws, kneading, in and out? That is one happy pussycat! She has the most remarkable green eyes - almost a chartreuse colour. 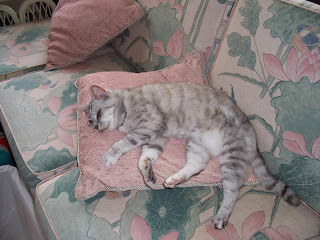 Of course, this is where she would rather sit - on my cushion, with me not there! 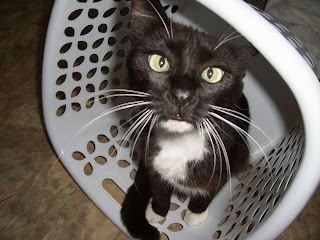 This is our other lady cat - little Nipper. We found her lost and starving in the shopping centre car park and of course took her home. She is a trifle crosseyed but very sweet. And very helpful too. Just see all the things she helps us with! 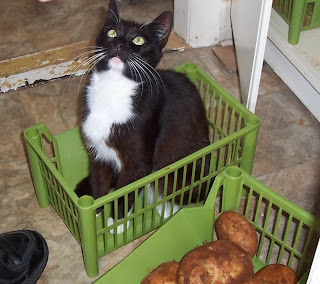 Helps put away the vegetables. 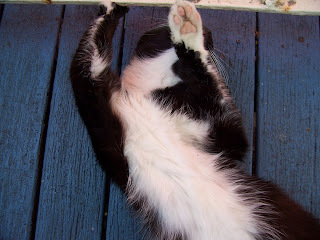 Demonstrates the most relaxing way to take a nap on the deck, or on a ladder when repairing the light fitting. 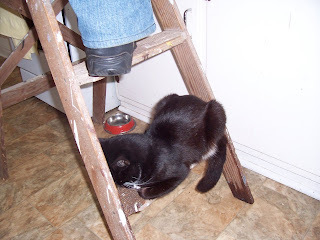 And of course - giving Dad your back to support his foot on when he is alighting from said ladder. And of course it is very important to show us how to fold that clean laundry - just right! Beautiful cats, Yvette! I soooooo miss our Clea and Champ! Someday, maybe another one!